Derek, my partner in crime, has a problem. He is what you might call an impulse buyer. It never really bothered me…until we started living in 230 sq. ft. Now it bothers me. Before in our sticks and brick house, he had his “own” room, I just shoved everything in that room and thought “out of sight, out of mind.” I can not do that anymore, almost every nook and cranny is taken up with Zoe’s toys, our clothes and that Costco toilet paper stash under our bed. See why I have that stash here. I have never had a problem with spending money, I just have a rule. Simple right? I get a new pair of shoes, I donate an old pair. Zoe gets a new toy, I donate like 50 old toys as often as I can. Derek might not follow this simple rule. Derek tried to find a way to bring our two hard shelled sea kayaks with us on the road. I said they were not worth fooling with for now. 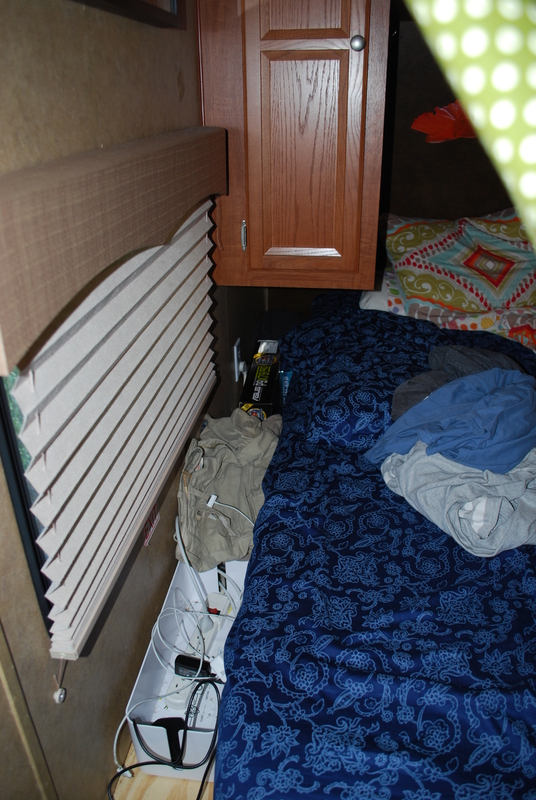 Who wants to climb up on the RV to put those kayaks on the roof, let alone drilling into the roof for the kayak rack. I tried to convince him, IF we really need a kayak we should get an inflatable kayak or just rent them. The look of horror on his face, you would have thought I told him Zoe, our daughter, wasn’t his after all. There was no way he would buy an inflatable kayak, they were not good enough. Fine. It was settled, hard kayaks stay in storage, if we want to kayak we would rent. We weren’t even 3 weeks on the road yet. We end up at an REI in Seattle, their flagship headquarters store, at 8:30 PM, the night before we are heading to Whistler for a month. Just in case you don’t know what an REI store sells, think of an outdoor adventure store, meets a badass bike stop, meets an LL Bean. Did I mention the store closes at 9 PM. Did I mention we went for rain paints and a fanny pack waist purse. So an hour after they closed, we were the last people rung up, we walked out of the store with an INFLATABLE kayak, paddles, life jackets for the whole family, fanny pack, and NO RAIN PANTS. I woke up one Saturday morning in Whistler and Derek had already been up for a few hours it seemed. Which is not that that out of the ordinary, since I refuse to get up until Zoe wakes up. But he had a factitious smile on his face. What did you do? I asked. What? Where the Eff are we going to put that? Yeah like we really need that I said, you are joking right? Nope, he wasn’t. It was being shipped as we spoke, thanks a lot Amazon Prime. Because of you, we can get almost anything in 2 days now. Effing great. 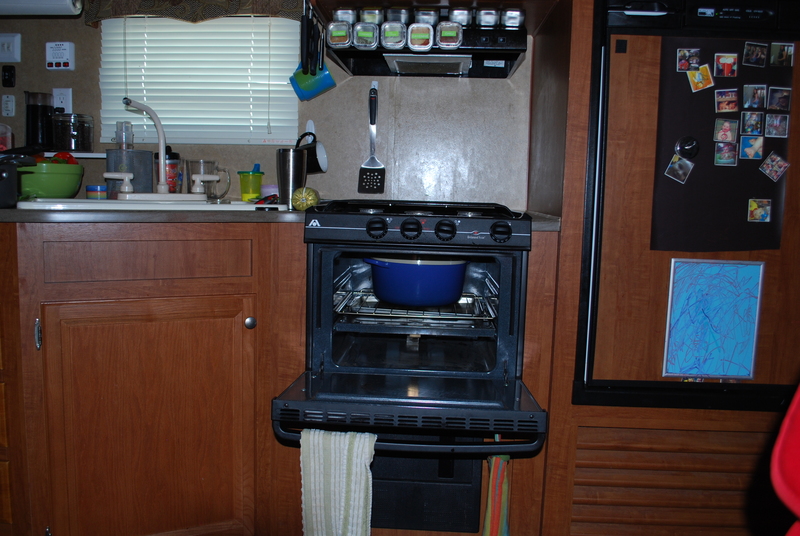 All I could think about was I barely have room to cook in this RV and I spend most time trying to keep it clutter free. Plus, you know what computers come with, cords. And do you know what cords do, they piss me off. Go ahead, go clink on this link so you can see my own personal hell. I will wait. Do you see what I mean? I demanded wanted to know his reasoning behind this purchase. Maybe this would be a good time to mention my OTHER rule for living in the RV. So I can name several things in my RV that have duel purposes. Name anything and I can tell you its second purpose. Just a few examples in case you are wondering. 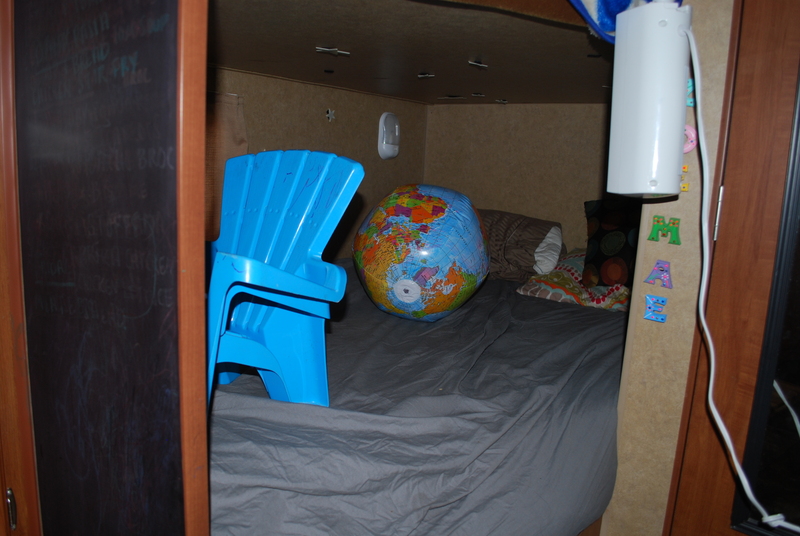 Our bed is a slumber heaven by night and a desk, clean laundry surface, cord holder by day. Our stove is a cooking machine by day and a storage container for our pots and pans by night. Zoe’s bed is her space by night but our store all by day. Back to the new computer situation. “You mean to tell me you bought a NEW computer for ONE sole purpose to make and edit videos.” *face palm* These better be some great videos. These videos better show our awesome adventures. These videos better make us famous on YouTube. Consume internet content by day and produce my blog by night. See DUAL purpose theme. I will be finding some of Derek’s personal items to donate shortly and I owe him a BIG FAT apology for doubting him. Hello, My Name is Monica and I have a problem, I love my impulse buyer, Derek. I’m with you on the dual purpose idea. However, I have not yet found a dual purpose for the heater, which takes up a good 1/4 of kitchen counter space. We could use that space! First – we aren’t in cold places much. And second – if we are, we have a portable heater that is cheaper, quieter, more energy efficient, and heats better. Ruhi, you have no idea how many times he says “I may or may not have bought (insert item)! Hello Wendy! WE also use 2 ply only and getting it wet before it goes down is a must, however I never thought about the 3 second rule. Wow…22 years on the road???? Have you been to every state yet? I am sure you have some wisdom. Do you ever blog or write it down? Would love to hear more.